For load development, some guys shoot 3-shot groups. Other guys shoot 5-shot groups, or even 10-shot strings. But for testing its projectiles, Sierra Bullets takes it to another level entirely. A while back Sierra was testing its .30-Caliber 175gr HPBT MatchKing in the Sierra uynderground tunnel. The results are show above — a FIVE HUNDRED Round group! The tunnel testers sent five full boxes of bullets down-range. Here are 500 Shots shot in a 300 meter tunnel. The group size is 2.82 inches (that’s edge to edge of the farthest shots, less the bullet diameter). This was a pressure/velocity test for a commercial customer. The Cartridge was .308 Win, loaded at 2.800″.The powder was Reloder 15. A 26″ barrel was shot from a return to battery rest. The gun was cleaned every 125 rounds and two foulers shot. What do you think — could you beat this group from a bench for 500 rounds? Ever wonder how (and where) Sierra tests its bullets? The answer is underground, in a 300-meter test tunnel located under Sierra’s factory in Sedalia, Missouri. The photo above shows the construction of the tunnel back in May, 1990. Like most bullet manufacturers, Sierra does live-fire bullet testing of its projectiles. 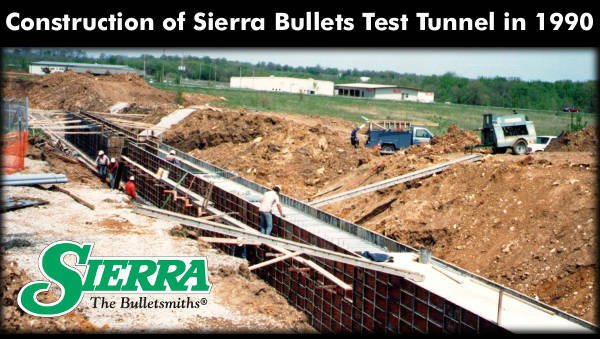 Sierra’s 300-meter test range is the longest, manufacturer-owned underground bullet test facility in the world. Sierra offers free tours of the test tunnel as part of Sierra’s Factory Tour Program. Share the post "500-Round Group at 300 Meters — Now That’s a Test!" Custom hunting rifle photo courtesy Kilimanjaro Rifles. The folks at Sierra Bullets asked a few staff bulletsmiths a classic question about guns: “If you could own only one firearm which one would you choose?” There were many interesting answers including a “cheater” response — the drilling — which is really two guns in one. The most-often mentioned chambering was the venerable .30-06. Respondents cited its versatility, hunting prowess, and ready availability of ammo. The popular .308 Winchester, as expected, got mentions as did its cousins the .243 Win and 7mm-08. There were quite a few votes for classic lever guns, as well as 12-gauge shotguns. Two bulletsmiths cited the .22 LR, and we can certainly see the logic in that answer. The little rimfire cartridge is versatile, quiet, and inexpensive. We ask our readers the same question — if you could only have one long gun, what type of firearm would it be? List the gun type and chambering in the comments section. This article original appeared in the Sierra Bullets Blog. Share the post "If You Could Own Just One Long Gun — What Would It Be?" Compared to a .223, the 6BR offers a much better selection of high-BC projectiles, and will deliver considerably more power on the target. Compared to the .308 shooting 168gr MatchKings, a 6BR shooting 105-107gr bullets offers better ballistics all the way out to 1000 yards. Plus, for most people, the 6BR is just easier to shoot than a .308. Recoil is less than half of the .308 cartridge. Both the .308 and 6BR chamberings offer good barrel life, but the 6BR uses 15-18 grains less powder, saving you money. On the other hand the .308 is the designated cartridge for F-TR and Palma shooting, so it may be a more versatile chambering for Long-Range competition. So which would we choose between the 6BR and the .308? Actually we think you should have both. The 6BR is my favorite cartridge out to 500 yards, and I like the .308 Win for F-TR. And… if you want to shoot at the World Fullbore Championships this week at Camp Perry there’s only one choice — a .308 Win. Share the post "Recoil Comparison .223 Rem vs. 6BR vs. .308 Win"
Here’s an item for tactical and Precision Rifle Series (PRS) shooters. Howa is releasing a new rifle with a modular metal chassis. The new Howa HCR (Howa Chassis Rifle) combines a Howa 1500 barreled action with a modern, fully-adjustable aluminum chassis. The Howa’s MSRP is $1299.00, so the HCR is directly competitive with the Ruger Precision Rifle (RPR). Available chamberings are: .223 Remington, .243 Winchester, 6.5 Creedmoor, and .308 Winchester. Mounted on an AR-style buffer tube system, the Howa HCR utilizes the fully adjustable LUTH-AR MBA-3 stock. Length of Pull is adjustable form 12.5″ to 16.75″. Comb height is also adjustable to fine tune for scope height-over-bore. Weight with a 24″ barrel is 10.2 pounds (before optics), so this Howa HCR is lighter that some similar rifles on the market. Available in .223 Rem, .243 Win, 6.5 Creedmoor and .308 Win chamberings. Share the post "New Howa Tactical Rig — Howa Chassis Rifle (HCR)"
John Whidden is always strong at Camp Perry (file photo from past event). In the Long Range Competition (Tompkins Trophy Match), John Whidden of Whidden Gunworks topped the field with a very strong 1240-77X performance. This victory secured John’s fourth Long Range National title. As in the High Power Championship, in the Long Range event SFC Brandon Green also finished in second place (1238-67X). Rounding out the Long Range podium was William Gelet with a 1238-57X tally. With his Long Range Championship win, Whidden took home a Tompkins Trophy Plaque, a Gold Championship Medallion, and a $500 Berger Bullets Certificate. John campaigned three rifles he smithed himself. These feature Barnard actions in modified Anschutz smallbore stocks. For the open-caliber events, John shot .243 Win-chambered rifles with 6mm 105gr Berger Hybrids. For the Palma matches he shot a .308 Win with 155gr Berger Hybrids. John’s ammo was loaded on Whidden dies of course. During the Long Range cycle, matches were shot with both iron sights and scopes. John had two different .243 Win rifles, one fitted with iron sights, the other with a scope. We thought our readers would like to see some of the ultra-accurate rifles campaigned by High Power competitors at Camp Perry. Both bolt-action and self-loading rifles are popular. Among bolt guns, Tubb 2000s and Eliseo tubeguns are popular. Semi-auto AR platform “Space Guns” offer some advantages (particularly during rapid-fire and for standing position), and are favored by many of the top marksmen. Many Camp Perry High Power competitors are also shooting less exotic AR service rifles. Tubb 2000 with a shortened handguard, and custom hand support bracket forward of mag well. The modern AR Space Gun, scoped version. Note the side charging handle, and absence of forward assist. A block fitted under the handguard helps with the standing position. The scope is mounted on a “piggy-back” rail that extends forward of upper receiver’s built-in rail. Share the post "Hail the 2016 High Power and Long Range National Champions"
Was Anything Wrong With The .244 Remington? The year was 1955. A time of carhops, drive-in movies, and Buffalo Bob. It was also the year that Winchester introduced the .243 Win and Remington counter-punched with the .244 Remington (now more commonly known as the 6mm Remington). The .243 Win was based off the time-proven .308 Win case while Remington chose the old war horse, the 7×57. We’ve all read countless times how Winchester chose the 1:10″ twist, while Remington adopted the 1:12″ twist for their .244 Rem rifles. The first complaint in the gun magazines of that era was how the faster twist Winchester could handle 100 grain bullets, while Remington’s [12-twist factory rifles were supposedly limited to 90 grain bullets]. The first complaint I remember reading was that the 100-grainer was better suited for deer-sized game and the 1:12″-twist wouldn’t stabilize bullets in this weight range. Now, let’s look at this a little closer. Anybody that thinks a 100-grainer is a deer bullet and a 95-grainer isn’t, has been drinking too much Kool-aid. In all honesty, it’s all about bullet construction and Remington had constructed the [90s] with light game in mind. In other words, Remington got it right, but due to a lack of knowledge at the time on both bullet construction and stability, the .244 never gained the popularity it deserved. At that time, Sierra had the 100gr SMP and Hornady offered a 100gr RN that would both stabilize in the slower 1-12″ twist. The .244 Remington provides another classic example of how the popularity of a cartridge suffered due to a lack of knowledge. Was the .244 Remington Actually Better than the .243 Winchester? Share the post "‘Also-Ran’ Cartridges — The .244 Remington (aka 6mm Rem)"